I’m not a turkey-sandwich-with-swiss-cheese-lettuce-tomato kind of gal. I sort of see lunch as a pick-me-up in the middle of the day, and un-inspired sandwiches that have been done 100 times before just don’t work for me anymore. Just look at my Instagram feed: apple and cheddar panini, tomato and mozzarella with prosciutto sandwich, zucchini and red pepper quesadilla with pesto dipping sauce. But, realistically, no one has the time to spend 30 minutes making lunch. (At least not every day.) But five or 10 minutes? That’s usually doable. 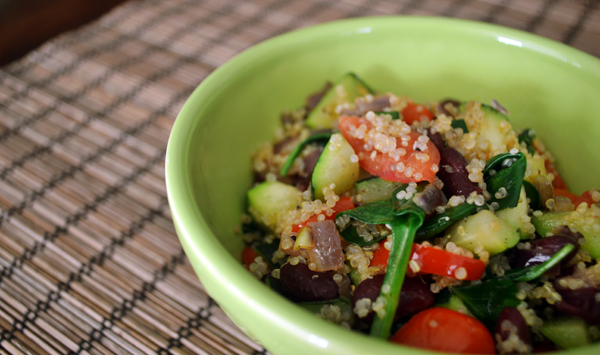 This warm quinoa salad can be made two ways: in the microwave, or in a frying pan. I prefer the frying pan method, but in a pinch the microwave method works great, too. I’ll detail the pan method below, but the microwave method is so easy, I’ll tell you how to do it right here: Combine 1/3 cup cooked quinoa in a bowl with the raw vegetables listed in the ingredient list below, and microwave for 1-2 minutes, or until everything is heated through. Top with whatever dressings or cheese you like! Since I’m currently working from home, I like to make single-serve batches of this dish (or a similar variation), but you could also make a big batch over the weekend and portion it out to take to work for lunch throughout the week. Heat 1/2 tablespoon olive oil a small frying pan over medium-high heat. Once warm, add onion, red pepper, and zucchini to the pan. Sauté until vegetables start to soften, 2-3 minutes. 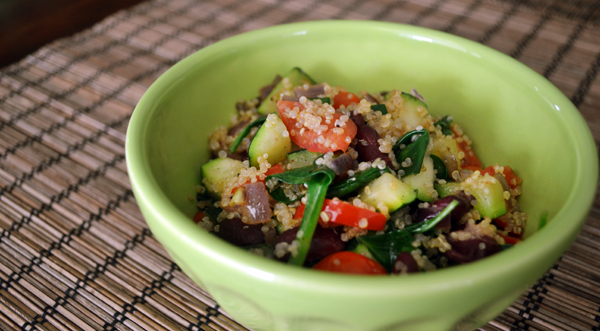 Once the onion, pepper, and zucchini begin to soften, add the beans, spinach, and tomatoes. Continue cooking for 1-2 minutes. After the spinach has wilted and the beans begin to burst open, add the cooked quinoa. Continue cooking for 1-2 minutes, or until everything is heated through. Serve, and top with whatever you like — simple oil and vinegar dressing, goat cheese, pesto, or hummus make great flavorings! Tags: Easy Meal, goat cheese, Lunch, Quinoa, red pepper, Vegetarian, zucchini. Bookmark the permalink. This sounds so easy and yummy.